One of the world's most visited websites, Yahoo offers all kinds of content and services - including "Yahoo Mail", one of the world's most popular email service. We'll extensively cover that offering; it's less known that Yahoo also owns the ultra-popular Flickr online photo sharing website, and Tumblr, currently one of the fastest growing microblogging platforms. The credentials you get when you sign up for a Yahoo account let you log into multiple sites and web apps. This tutorial covers the Yahoo login process, with a detailed look at the sign-in page: regardless of the service you use, you'll end up with that same form as long as Yahoo authentication is needed! 2 If someone is already logged in, mouse over their username (top right), choose "Sign Out" from the dropdown, and start over. 3 Click on the Sign In link in the top right corner. 4 Enter your username or full email address. 5 Type your case-sensitive password. 6 Hit Enter or click "Sign In"
To login to your Yahoo account, click on the Sign In link: it will redirect you to the form at login.yahoo.com, through which all authentication attempts go through (when signed out, even typing "mail.yahoo.com" actually sends you there - same for flickr.com/signin!) Whenever someone successfully logs into your account, there will be a record of it: check your Yahoo login history if you have any suspicion that someone unauthorized might be accessing your account. Note: if someone is already logged into their Yahoo account, you'll see their username instead of the Sign In link. In that case, manually logout: mouse over the person's name, and click on the "Sign Out" link in the dropdown. That account will be logged out, and you'll be redirected to the Yahoo homepage. You'll now be able to see and click on the Sign In link in the top right corner. Once logged in, you can change your profile picture to anything you want! FYI - if you decide that you no longer want these third-party credentials associated with your Yahoo login, no problem: it literally takes under a minute to remove your connected accounts. Whatever Yahoo service you want to use will redirect you to the same login form if authentication is required to go further (like checking your emails). In the Yahoo ID field, enter your full email address, or just your username (the part of your email address that comes before the "@" symbol). If you only enter the username, Yahoo will assume that the domain is the one you used to reach the login form. The Password field is case-sensitive, so make sure that CapsLock is turned off, and pay attention to your capitalization when you type. If you forgot your password, or if you can't login for any reason, notice the "I can't access my account" link below the "Sign In" button: clicking on that link allows you to reset your Yahoo password - either by receiving a password-reset link to the alternate email address you added to your account, or a verification code sent as SMS text message to the contact cell phone added to your account. Note: if you are able to login but want a new password, don't go through the time-consuming hassle of resetting it. 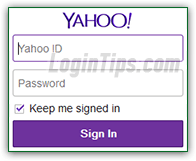 Once signed into your account, just go change your Yahoo password in a few clicks! Yahoo also supports the enhanced security feature known as " two-factor authentication ": in addition to entering username and password, you have to provide a second verification method. Yahoo calls is "second sign-in verification": whenever you login from a new / unrecognized web browser, you'll have to confirm that "you are you" by verifying a code sent to your cell phone number as SMS text message, or to one of your alternate email addresses. Protect your account by setting up second sign-in verification - even if someone knows your password, they can't log into your account! That's a feature Yahoo calls "two-step verification", because of the extra step needed to authenticate yourself when you login (the first one being to enter your username (email address) and password). Surprisingly, the "Keep me signed in" checkbox is checked by default; this is a security concern, since if you aren't paying attention, you could accidentally choose to stay logged in on a public computer (at the library, at work, at school, etc.) by forgetting to uncheck it! Make sure to uncheck it on any computer you don't fully trust, like your laptop, desktop computer at home, etc. Short of logging out, you can change your sign-in settings to control how long you stay logged into your account. If you keep that checkbox checked, a "cookie" will be created on your computer, for this particular web browser: that's a small text file that stores various pieces of information about your preferences (example: before you login, that's how e-commerce stores keep track of your cart's content - once you sign into your account, the items are copied from the cookie and stored into a database). • Windows (all versions) - hold down the  key and press L.
• Mac OS X - hit Cmd+Option+Eject or Cmd+Option+Power (depending on keyboard). • Linux (most distributions) - press Ctrl+Alt+L. When you do done, click on the Sign In button: if your credentials matched (correct username and password combination), you'll be redirected to the resource your were trying to access in the first place: the Yahoo homepage, your messages (how to customize your inbox), your Flickr account, etc. In fact, you could just login to Yahoo instead of each email account you own: you can add "send-from" email accounts so that you can use them to send (or receive!) their messages right from Yahoo Mail! Tip: after the fact, you can also change your "From" display name (the name recipients see for messages you send) or change your reply-to address (the email account where responses go). To quickly find important messages in your inbox (and other email folders), make sure to use "email flags": Yahoo Mail calls them "stars" - here's how you Star / unstar messages in Yahoo Mail. Although you can use Unread emails to keep track of things left to do (manually mark emails as read or unread), it's easy to accidentally open a message, which will mark it as read! If you prefer to check your Yahoo messages from an email program, all you need to set that up are Yahoo's mail server settings. You can save time by sorting incoming messages by creating mail filters (email rules) that automatically move matching emails to a folder, or block senders and domains. To find specific messages by content, sender, or other attributes, use Yahoo's email search tool. To keep unwanted messages from your inbox, manually report spam and customize junk mail settings (before spam is deleted) - and learn how to delete email messages. To make your emails look more professional (and type less! ), automatically add a signature and default font settings in your messages, including as much info as you want. And when you go on holidays, don't forget to create an out-of-office vacation response to automatically answer all emails! (Or automatically forward them to another account / person) With the Calendar, you can send yourself reminders by email, SMS text, or Yahoo Messenger notification! Note: the fact that Yahoo owns Flickr, the world's largest photo sharing site, for amateurs and pros alike, means that Yahoo Mail offers some of the most beautiful pictures that you can use when you change your Yahoo Mail theme - either solid colors or "photo themes" with a background image! It only takes a couple of clicks to add new contacts to Yahoo Mail. But if you are migrating from another webmail provider (or even another Yahoo email account), you can easily import your contacts from a CSV file (or any Excel file, for that matter). Yahoo also lets you export your contacts to that CSV format and a couple others! LDIF address book for Mozilla email programs like Thunderbird, and as vCards that you can easily import into any version of Microsoft Outlook. Yahoo Mail also includes a tool that automatically logs into another account to import its contacts, daily: import Gmail contacts, import contacts from Hotmail / Outlook.com (any Microsoft account), or import Facebook friends as contacts. You can even import contacts from another Yahoo Mail account. Tip: if, after importing or manually adding people to your address book, you find redundant entries, don't worry. Yahoo Mail includes a tool that helps you find and merge duplicate contacts! To create newsletters or easily email a group of friends, consider creating a contact list: address a message to the single list name, and all members of that list will automatically be added as recipients!